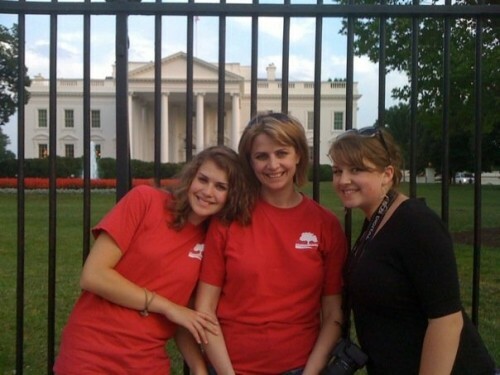 In 2009, our family took our first cross-country road trip. Since then, we have logged almost 70,000 miles together as a family, criss-crossing the United States many times. 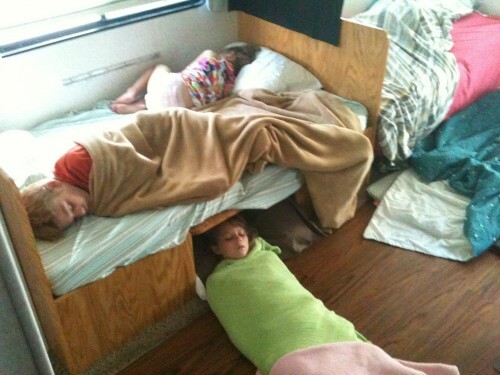 It had two sets of bunkbeds in the back instead of a master bedroom. It slept up to ten… not comfortably, but it could be done. I could write for months about the RV, and indeed, I might—but I have met so many parents who want to roadtrip with their kids that I think for this post, I’ll cut to the chase and give you some practical tips. If you’re homeschooling, a word of caution for those of you who think you’re going to be “roadschooling” and that it will look even remotely like regular school. Also, my husband did not appreciate our lack of privacy—but that’s another post for another day. As I write this, we are on our way home from a long four months of travel. As an author and speaker, we depend on this time of year, as it’s the “busy season” for conferences. Our travel is what supports our family in many ways—but we didn’t start out that way. We started out with a desire to reach out and touch other families… and along the way, we discovered a new way to live. Homeschooling? Leave your “regular” school books at home. Really. Whenever possible, stop and see interesting things. Visit national parks. 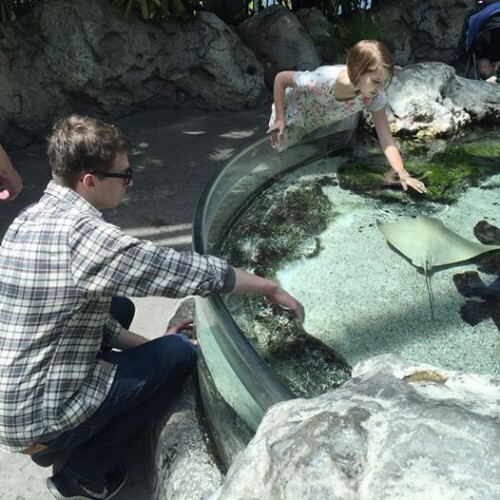 Visit local aquariums and museums. Learn the history of the places you’re visiting. Go to the ocean. Instead of spending our limited funds on places like Disneyland, we opted for places like “The Hermitage” in Tennessee, “Fantastic Caverns” in Springfield, Missouri, “Monticello” and George Washington’s home, “Mount Vernon.” Our children have seen the Magna Carta, walked the battlefields of Gettysburg and touched the Liberty Bell. *side rant* My husband and I fear for a generation of children who don’t know the history of the United States or the path to freedom that was so hard-won. It’s not enough for us to expect our kids will learn all they need to know about our history from textbooks. Nothing can take the place of actually being there.Make some *real* memories instead of asking the kids to write about what they’re “learning” on the trip. Trust me on this one. They’re learning. Less is more. 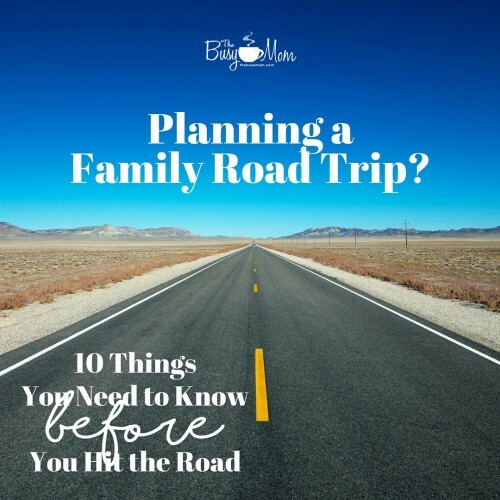 I took everything and the kitchen sink with me on our first trip—because I didn’t know that it was more realistic to think of myself as the “motorhome mama” that I inevitably turned into whenever I didn’t feel like using all those “necessary” items. I mean to tell you, that Pampered Chef microwave cooker (which I paid top-dollar for) taunted me from it’s place in the cupboard every time we ate at Taco Bell or cracked open a skillet meal from Costco. In 15,000 miles, I used it twice. 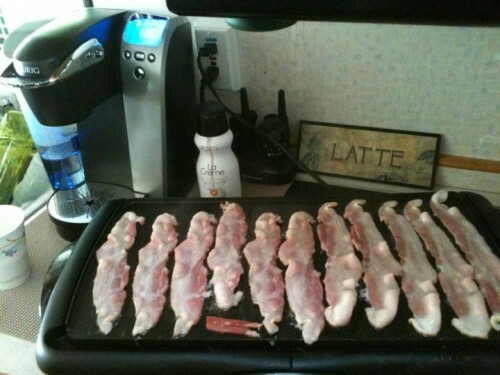 Two years later, when we swapped our class “C” for a class “A,” I brought three things I knew I would use: an electric griddle, a single serve coffee maker (saved us a million bucks in Starbucks) and my crockpot. Protein > Carbs. When you’re on the road for hours at a time, avoid snacks that are rich in carbs. Carbs make kids wiggly and wiggly kids do not last long on the road. We stock our car cooler with hard-boiled eggs, cheese, jerky, nuts, and veggies when we can. And just in case you think I’m no fun at all, we do indulge in bite-sized candy bars and local sweets. But trust me. If you can keep simple sugars and carbs low, your kids will last longer … and so will you! Check out this travel snack pack! 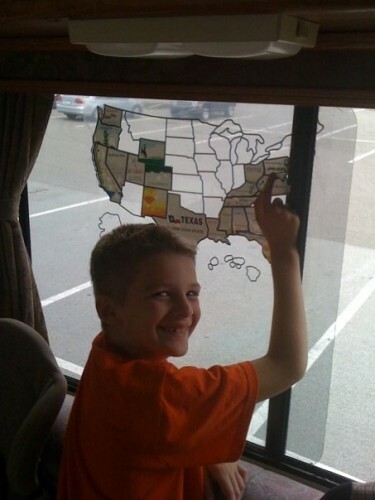 Maps like this are must-haves… if you have the window space! Hit the road early—and get off around dinner time. We’ve done it all: traveled through the night, traveled until we were all just dead on our feet. But when we started being disciplined about getting up early and getting off the road around dinner, something wonderful happened: we started enjoying the road much more! If you think about it, it’s common sense, which makes me wonder why it took me nearly 15,000 miles to figure it out. This was our second RV. As you can see, we made the most of the space we had! Hoteling it? Use price-cutting apps. I don’t have time here to explain all the differences but I have found that I can stay sometimes up to 70% off using these apps. Of course, it doesn’t always work; if you’re in Yellowstone during peak season, you’ll be hard-pressed to find great deals. Favorites? Priceline and Hotwire. Our rule-of-thumb is that we like to be under $65 per night, and that the hotel must have breakfast. Many of the hotels serve dinner and breakfast, making a higher cost worth it, especially if you’re traveling with a crew like we have done.Come to think of it, I’m going to write a post about my favorite apps for traveling. I have several that we can’t live without. This trip, we started using Air B&B … and I think we’ll never go back to just hotels again. That’s a blog post for another day. 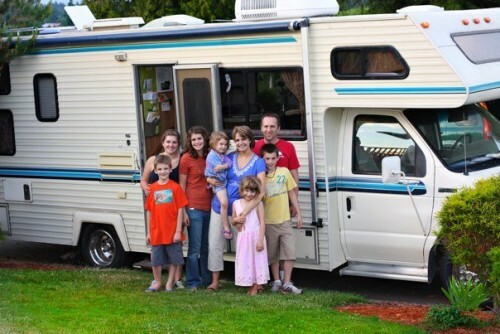 RV’ers: if you’re trying to save money, most WalMarts still allow RV’s to stay overnight for free. It’s great! Some of them even have hookups, but those are few and far-between. Never take your safety for-granted. I hate to have to put this in here, but we’ve learned the hard way that the road is not always friendly to travelers. We were robbed blind in New Orleans on Father’s Day in 2009—a memory that will stay with us forever. In just twenty minutes, a group broke into our RV and stole almost everything we owned. Nothing was spared. Now, we travel with our eyes peeled, and we never leave things like laptop computers in vehicles. We put them in backpacks and keep them with us.Know gun laws in each state if you conceal carry. Stay safe out there! Carry a paper atlas with you. Phones can die. GPS systems can fail. Ask me how I know. You need to be able to navigate your way around the “old-fashioned” way. Use them, yes. But never rely on your electronic devices to get you where you’re going. 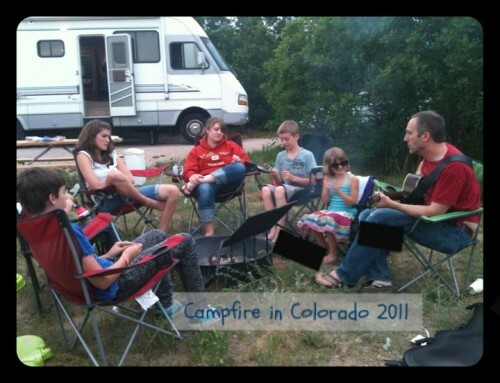 It’s been eight years since we became hard-core, homeschooling road-trippers. This year, we have traveled over 17,000 miles in our Honda Odyssey, which has pulled a small cargo trailer triumphantly from sea to shining sea. If it seems overwhelming, it is. But it’s worth it. I have a few days left of sitting in this car … and I’ll try to put together some more tips along the way. 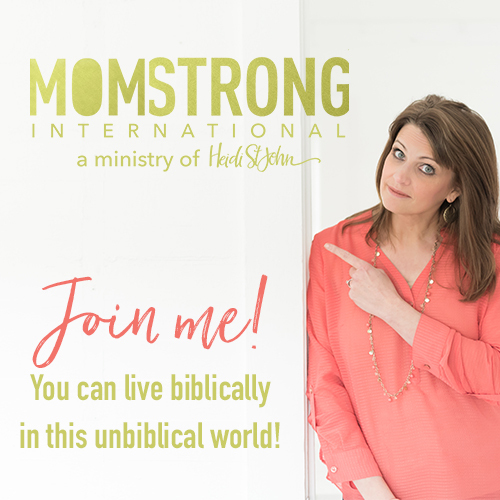 One of the biggest challenges I find with homeschooling is scheduling it all in. Even if we don’t have a super set and outlined schedule, it’s still one of the biggest stressors when it comes to the homeschool year. I want to make sure I fit in everything, but I also want to make sure I’m not overwhelming anyone. 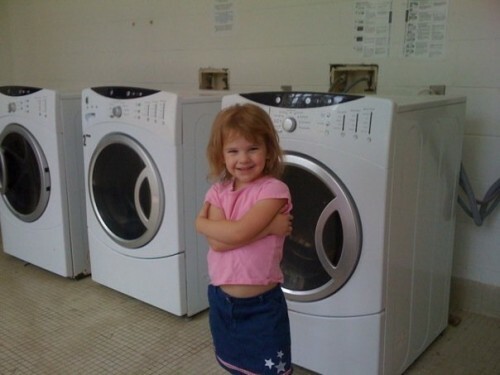 I tend to let my kids lead in that realm of things, as far as how much they can do. I set the guide because we do need to cover certain things each year, but beyond that – it’s up to their ability and desire. 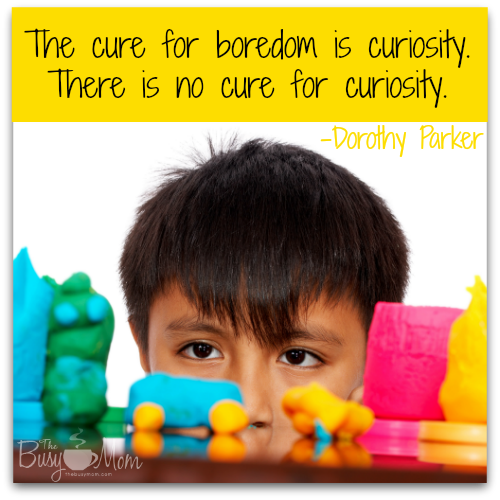 We usually end up doing much more than I had planned because my kids are eager learners and love to read. Often times at the beginning of the year I’m shocked at how much we have planned for the year. I believe that our relaxed approach to our schedule is a huge contributing factor to them having such a love of learning. The next challenge is the wide age range of my children. 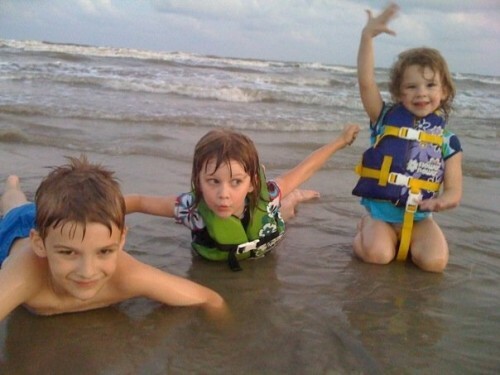 My eldest is in 8th grade, then the next of my kiddos is in 1st, followed by my little one who is 3. I guess the three-year-old would be considered preschool or toddler school level. As you can see, we have a pretty big age range. 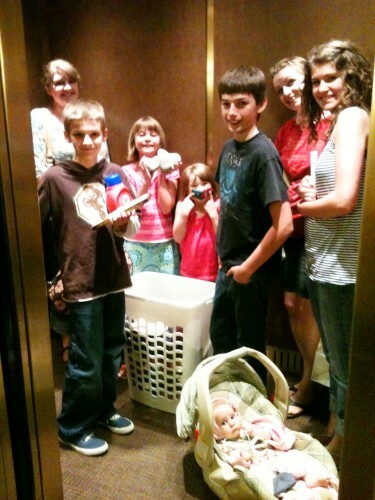 You might have more kids which might mean you have several kids in multiple different grades, more than I do. 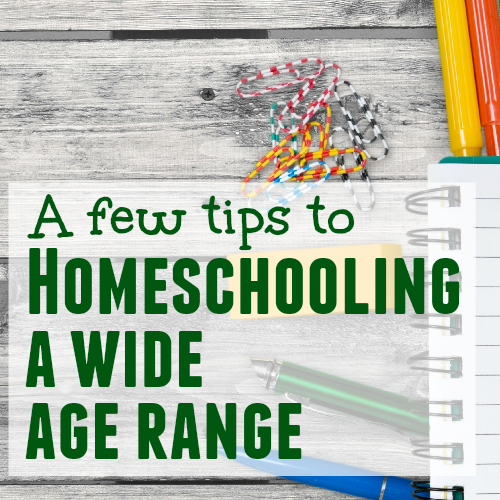 So, how do we face head on homeschooling a wide age/grade range? See if there is anything you can teach all of the kids together. For instance, if your 8th grader is studying American History, why not have your younger children study American history too? They don’t have to do it at the same intensity or depth as the older one, but they can still do it. Many curriculum options out there offer this flexibility to tailor their curriculum for older and younger students to use at the same time. But if they don’t have that option, you can easily relay the information to your younger one in a manner that they understand. Next, keep your schedule super simple. For us, this is essential. And as more of my kids are heading into school age, it’s been a huge life saver for us. I have a rather untraditional schedule with my kids. It works for us and it helps me teach each of them according to their needs without feeling like I’m overwhelmed, overwhelming them, or missing anything. My approach: I don’t teach every subject every day! That’s right. We have designated days for our more meaty subjects. This allows us to focus on one topic at a time and allows me to spread myself amongst my kiddos to give them the best attention I can. So, how does this look you’re wondering? Let’s say we do Math on Monday, History on Tuesday, Science on Wednesday, Language Arts on Thursday, and Foreign Language on Friday. That’s just a sample of what it could look like. Many wonder – but what about constant practice? What if they forget skills from one week to another until that subject day arrives? Using the example above, Math would be taught on Monday. We would work through the lessons and then practice with our worksheets. I would work with the older student first and work my way down through the younger ones. Then Tuesday comes along and we’re on to History, but before we start History we do another Math worksheet. Our math program offers 5 worksheets for each lesson so it happens to work well with our schedule. If that weren’t the case, I would simply create or find worksheets based on Monday’s lesson. This way, they are refreshing and practicing their newly learned concepts all week, but just with a simple worksheet which takes maybe 5 or 10 minutes. They’ve taken the core of the lesson on Monday – leaving the rest of the week for practice. Back to Tuesday, when we’re on History. After we do our Math worksheet we do our History lesson and discuss it. We do some map work and really dive in to any discussion questions that we may have. But we don’t just forget about it until next week. On Thursday we would have a brief discussion with my youngest about what we learned on Tuesday and I’ll have my big kiddo write down a paragraph or two. Catering to their capabilities. This keeps things fresh in their heads, allows for time for it to really soak in for a day or so, and allows for me to see how much they have retained. It’s a super chill approach to learning that we have grown to love. If this schedule just does not appeal to you, I have another suggestion. We’ve tried this method before and although we liked it, we went back to our one-subject-a-day method. Work with your older kids first. They are more likely to have work that they do more independently than your younger ones, but may need you to either teach the lesson or at least assign them the lesson for the day should they be working on it independently. When my eldest hit 6th or 7th grade, she did a lot of her work independently and I would just grade her work and discuss it with her after. Once you’ve finished with your hands-on lesson teaching with your older kiddos, move on to your younger ones. You’ll have the peace of mind that your older kiddos are working on their school work, which allows you time and focus to teach the younger ones. Encourage independence as soon as they show readiness. As I mentioned above, my eldest started doing a lot of her work indecently once she hit 6th grade, for sure by 7th grade. How did I know she was ready? It just got to a point where I realized she was ready to take a stronger hold of the reigns and work at her pace. She works much faster this way too. I think my schedule was holding her back a bit. Total side note: This is something I just adore about homeschooling, my kids can begin to work at a pace that suits their learning needs and style so much sooner than they could in what’s referred to as a traditional school setting. But with homeschooling booming, I think traditional is changing. Don’t try and teach each of them different subjects at the same time. If your kids are working on two different subjects at the same time, it should be independently. Stretching yourself into different subject directions AND grade directions will cause you to burn out. Plan your schedule realistically. Don’t try and do every single thing every single day with each kid. It’s just not realistic. I like to think of it this way: in college, do you do every subject every day? Nope! So there is no harm in not doing every subject every day now either. Work with the older kids first, then work with the younger ones. While you’re working with the older ones have the younger ones work on something like handwriting or maybe give something for them to color. I have a few connect the dots booklets for my younger kiddo. This keeps her busy while I teach her big sister, and helps her practice her numbers! And finally, encourage your kids to begin working independently as soon as they show readiness. This is beneficial to them and their development. Taking ownership of their work is exciting and encouraging for them! 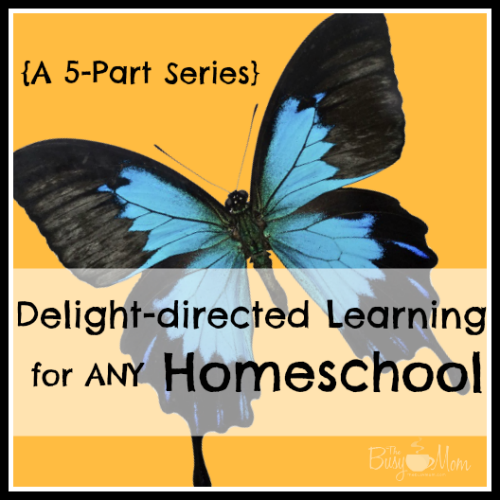 Welcome back to my series, Delight-directed Learning for ANY Homeschool. Part One: Talk to your kids or maybe just pay attention to what they talk about most. 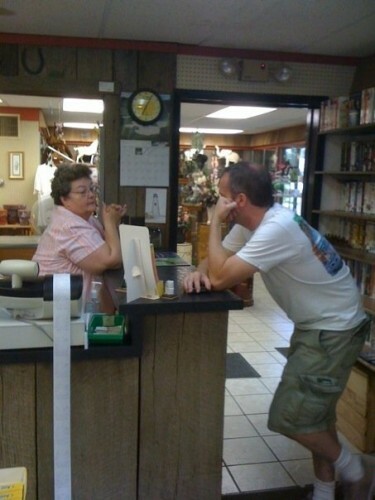 What piques their curiosity? There really are very few topics that cannot be developed into an educational experience. We often take these topics and create unit studies. Part Two: Notice when your student gets excited by something you are already teaching. It really can be as simple as giving your student some extra time to follow a rabbit trail. Part Three: Notice what has piqued the interest of your student and then plan a field trip based on that interest. 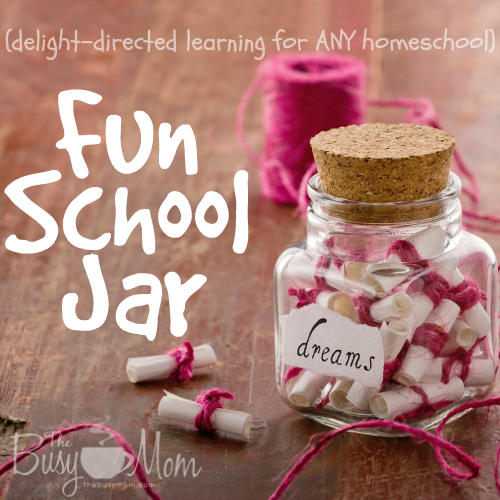 Part Four: Create a “fun school” jar with exciting activities you know your kids will enjoy. This week, in my last installment, I want to expand on one last idea that I mentioned briefly in Part Two. Fill a book basket with books on your student’s topic of interest. Using book baskets is something I learned early on in our homeschool journey, and this method of learning serves a dual purpose. First of all, filling a basket full of colorful picture books, interesting nonfiction books, and inspiring biographies exposes your children to different genres of literature and encourages a love of reading. Secondly, reading is just a great way to learn. Put away the boring workbooks and dry textbooks and let your students enjoy learning about interesting topics from real, living books. Even if you do nothing else but let your child read (and read to him), deep, rich learning will occur. Head to the library and check out books on any subject your student wishes to learn about, and then spend a day (or a week) reading all of them. 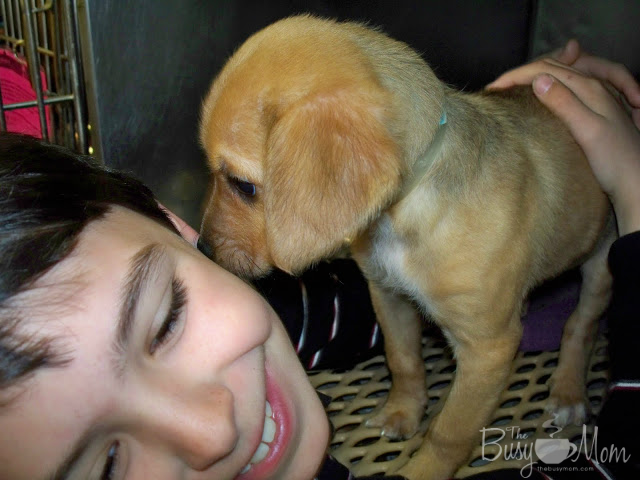 You will be amazed at how much your kids learn from reading about topics of interest to them. It’s likely you can also shop your own bookshelves for books to read, too. You’re a homeschool mom; every room of your house has a bookshelf, right? If your kids don’t read them all, that’s okay, too. But chances are good that if you take them to the library, teach them how to find books based on a topic they love, and then set them free to choose the books, they will at least look at them! Use them for required reading, free reading, read aloud time, and bedtime stories. Any time, day or night. It doesn’t have to be just during school hours. If your kids are reading about a topic they love, they will want to read (or listen to you read) about it all the time! 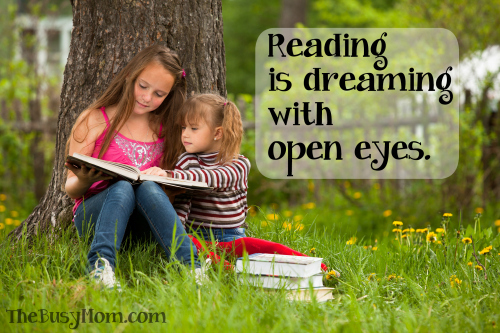 Using this method has encouraged my son to love reading for pleasure, and for school. For a long time, he didn’t even realize he was “doing school.” Today, I rarely have to make any kind of reading list for him. He devours books faster than I can supply them. Our library always has a stack ready to be picked up. And yes, there are many days that all he does for school is read. And I am perfectly fine with that. Which brings me to the topic of working with kids who don’t love to read so much. That is another great benefit of this method. If you have reluctant readers, be patient. This method of learning may not be an immediate hit, but if you fill their book baskets with books about subjects they choose and are passionate about, it’s only a matter of time. In the beginning, they may only flip through and look at the pictures. That’s okay. Give them time. Read to them more. Help them explore things they love with books. They will come around eventually. Read more from Marcy in her Author Box below! Welcome back! Did you catch the first installment in this series last month? I shared about how talking to your kids (or listening to what they talk about) can give you many ideas about how to incorporate delight-directed learning into your homeschool. If you missed that article, be sure to click over and read more about that. This month, we’re going to take a look at another great idea for accomplishing the same goal of adding delight-directed learning to ANY homeschool. Another effective method to encourage delight-directed learning is to simply notice when your student gets excited by something you are already teaching. Many homeschool moms are intimidated by delight-directed learning because they believe it means that everything has to be done from scratch. But that is not necessarily true. You don’t have to create an entire unit study or do anything else particularly labor-intensive. 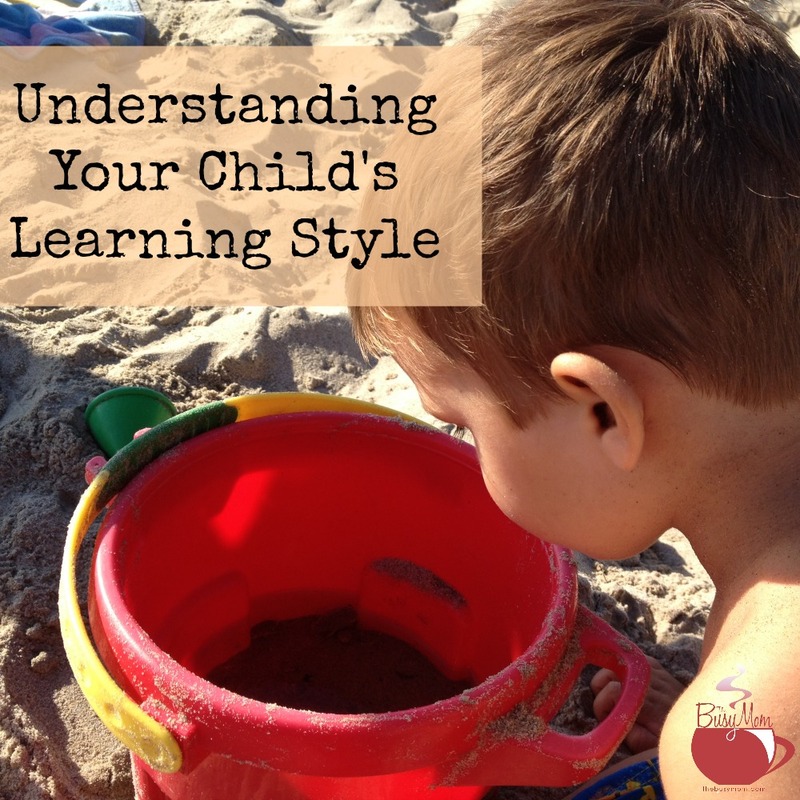 In fact, our journey into delight-directed learning began when we veered off course from a pre-written, pre-secheduled, pre-purchased, boxed curriculum because something we were already studying piqued the curiosity of my son. And it happened more than once! It really can be as simple as giving your student some extra time to follow a rabbit trail. You can do this by providing a themed book basket filled with picture books, chapter books, nonfiction resource books, and DVDs. Or you can add arts and crafts, projects, lapbooks, notebooking activities or website searches for their chosen topic. How much you give your student access to will depend upon how much time you are willing to veer off course. We’ve had rabbit trails take just a day to satisfy the need to know more. Others have literally taken weeks, even months. 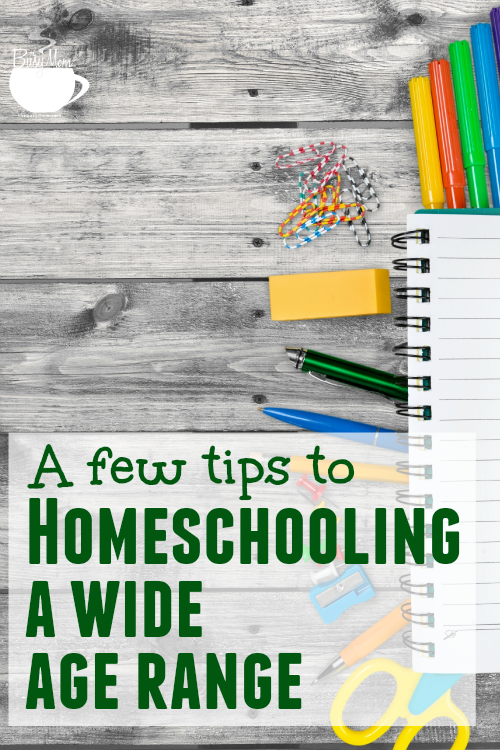 If you suspect this new interest will be ongoing, you could simply create another “class” for your homeschool and offer that option for continued study on a daily or weeky basis. Then resume your usual lesson plan. However you decide to indulge your student, there can be great rewards. Being willing to stop and follow rabbit trails can delight your student, and creating an atmosphere of delight does wonders to encourage a love of learning. 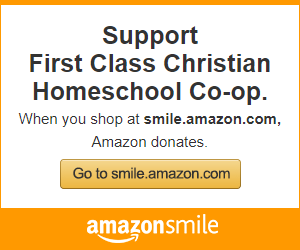 Isn’t that our goal as homeschool moms?